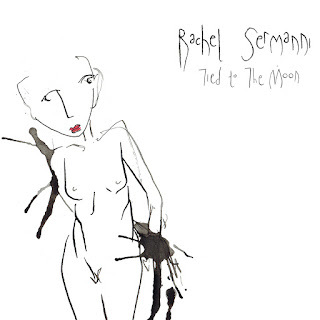 It feels like Rachel Sermanni has been around for a fair while, indeed this month sees the release of her second album 'Tied To The Moon', the follow up to her 2012 debut 'Under Mountains'. Yet she is still only 23 years old, making her achievement's to date even more impressive. She's toured the world with a whole host of household names (Elvis Costello, The Staves, Mumford & Sons, Stornoway), as well as numerous trips between her native Scotland and the rest of the UK. The basis of 'Tied To The Moon', which is available through 'Middle Of Nowhere Recordings', was developed last year when Sermanni secluded herself in a makeshift studio in Nova Scotia, Canada. Then with a little help from Jennifer Austin (piano, organ, backing vocal), Gordon Skene (bass and cello), and Louis Linklater (drums), she recorded all 10 tracks of the album live with Colin Macleod in his living room in the Scottish Highlands. The result is a brooding, powerful body of work where Sermanni is able to offer her listeners an insight into her dark and often melancholy poetry, whilst the music itself is almost a juxtaposition to that at times, as it's full of groove and panache, alongside the more tender softer parts. Of course we've also got to mention her vocals, which by our ears are some of the finest we've heard for quite some time! An album that rewards on repeat listens, 'Tied To The Moon' comes highly recommended. ALBUM: JOYWAVE - HOW DO YOU FEEL NOW?